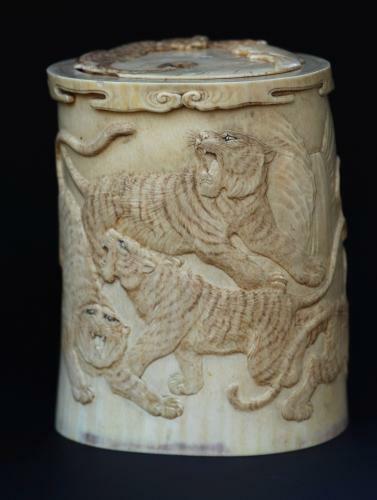 A Japanese Meiji period superbly carved ivory brush pot with ferocious tigers attacking an elephant. This piece has very finely carved animals with staining to create the markings on the tigers. The lid also has a carved tiger but does have some chipping to the edges. The base is wooden . As you can see on the last photograph, unfortunatley there is some staining to the interior, as the piece has been used as a pen holder in more recent times. The brush pot was used by scholars to store their calligraphy brushes. Further high definition images can be forwarded on request.